1. Onions, chili, lemongrass, star fruit vegetables, cut in small slices. 2. Mix with tempe, grated young coconut , teri, salt and sugar. 3. Give basil. Stir well. 4. Prepare banana leaves and sticks. 5. 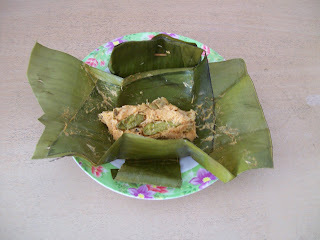 Fill the mixture into the banana leaves. Give small chili. 6. Steam for 20 minutes until cooked. 7. Serve with warm rice.